January 2018: Independent Publishing Now! Welcome to the January 2018 edition of Independent Publishing Now!, IBPA's monthly e-newsletter featuring the latest news and information from IBPA and its members. 2018 is going to be a big year for IBPA and its members. We just finished shipping the final batch of IBPA Benjamin Franklin Award™ submissions. It's all in the hands of the judges now! This is IBPA's 30th annual awards ceremony, and with almost 1,500 entries we couldn't be more excited. As many of you know, the awards ceremony will take place during a special dinner at the annual IBPA Publishing University conference - the premier educational event for independent and author publishers. Registration is open (and discounted for members). If you're new to IBPA Publishing University, you can learn about our breakout sessions, preconference programs, and check out our list of scholarship winners. And the best part? We added Learning Levels to help conference attendees decide which sessions are most beneficial for their level of experience. Last, but not least, IBPA members have been experiencing success with our brand new Media Outreach Program, which sends a targeted email to a "customized-for-their-book" media list of over 3,000 editors, bloggers, book reviewers, and more. Additionally, our recent increase in the number of available Library Market E-Blasts provides more members the opportunity to get their work discovered by librarians across the country. With three new categories, the Library Market E-Blast program is another exciting part of the new year. Kerry Dunnington is a chef, food blogger, and the author of three cookbooks. Kerry Dunnington's award-winning cookbook, The Seasonal Kitchen, was selected for review in Publishers Weekly magazine. As any author who has submitted to PW knows, this is an incredible (and rare) achievement! Published continuously since 1872, the internationally syndicated magazine receives over one thousand book submissions each week. "The chances of getting selected for a review are like the chances of winning the lottery," Dunnington says, "and it's even rarer for cookbooks!" The Baltimore native, chef, and caterer is passionate about sharing her knowledge of healthy food combinations. The team at Artichoke Publishers, who released Dunnington's book on September 1st of last year, shares her passion for creating independent cookbooks that combine great information with eclectic and inspiring dishes. In addition to The Seasonal Kitchen, Dunnington has written two previous cookbooks, Tasting the Seasons, and This Book Cooks, and has been the recipient of multiple book awards. You can visit Dunnington's blog, In the Kitchen with Kerry, for the latest news (and some great recipes)! Author Lehman Riley and Paul Dixon of Papa Lemon Books. Author L.A. Hider Jones' debut novel, My Interview with Beethoven, has been chosen by Kirkus Reviews as one of the eight Best Indie Fiction of 2017 titles! "This was an unexpected honor, beyond anything I could anticipate or expect," says Jones. She published her novel last May, using the CreateSpace Independent Publishing Platform. But Jones' interest in the composer started at a young age after her father brought home an LP: "Beethoven's Fourth Piano Concerto in G Major." Since then, Jones' fascination with and passion for Beethoven's music has remained strong. "Beethoven has inspired so much good in my life." She explains. "Through My Interview with Beethoven, I write to pay the inspiration forward to my readers." Her time and dedication to the topic has clearly paid off, and readers have expressed a great love for the book. "I feel you have given me a gift," says one reviewer. "I've listened to more of his music in the last few weeks than I have in years!" The title is now available through both Amazon and Barnes and Noble. 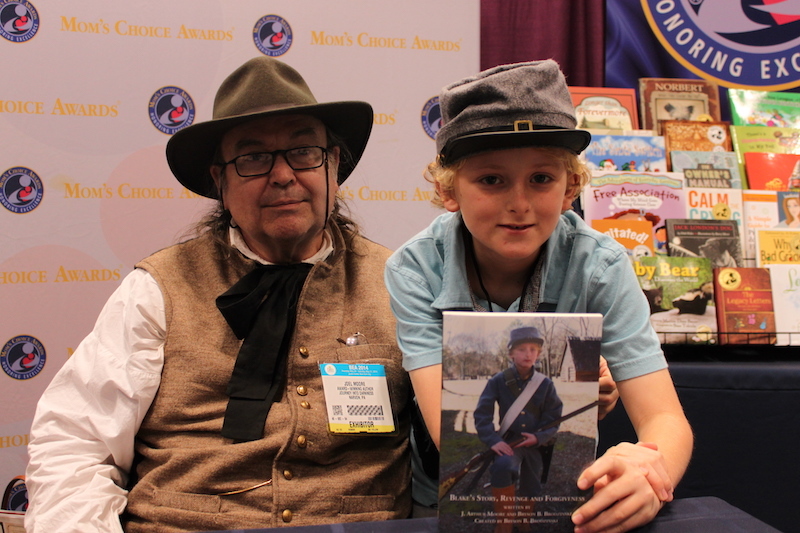 Author J. Arthur Moore and his great grandson pose with Blake's Story, Revenge and Forgiveness, at the Mom's Choice Awards. Since retiring from his 42-year career as an educator, J. Arthur Moore now has the time revitalize his written work through publication. Recently, his Civil War Historical Fiction titles have been re-released in revised formats, including added historical reference sections. Moore has also written short pieces and short stories, as well as Heir to Balmawr, a drama for his fifth grade students. His first book, Journey Into Darkness, has received critical acclaim, including a Book Excellence Award, A Readers' Favorite Silver Medal, and a Mom's Choice Award. His latest 2nd edition title, Blake's Story, Revenge, and Forgiveness has also been honored with a Mom's Choice Award, among others. The story follows a young boy who runs away to avenge his father's death during the Civil War. "In a war which saw the services of over 200,000 boys seventeen and under," Moore explains, "these books enable the young reader to live the history through the experiences of a peer." Award-winning author, publisher, and educator Karl Beckstrand. Karl Beckstrand's latest book, The Bridge of the Golden Wood: A Parable on How to Earn a Living has been selected for primary curriculum by the State of Vermont (distributed by Baker & Taylor, Follett, Ingram). Beckstrand launched Premio Publishing & Gozo Books in 2004, with a focus on creating multicultural books for all ages. "...Our educational children’s books capture attention and create repeat readers," Beckstrand explains. "They simply feature black, white, Asian, Pacific Islander, Hispanic, American Indian, and mixed-race characters—with family values like courage, sharing, and loyalty." Premio's publications also include Spanish & bilingual picture books, STEM activity books, and YA fiction. Beckstrand, a prolific author, gives presentations to large organizations and small groups on "Writing, Publishing & Marketing Your Story for Broadest Impact"; "Artistic Education", and a variety of other topics. He also facilitates panels, workshops, and labs (in Spanish and English) and does short Skype appearances at no charge. "Karl has an incredible way of using his gifts and skills to connect," says author Tiffany Coughran. "[He] easily reaches audiences and keeps them!"